Inspired by J Schwanke and Christopher Grigas...This is Ashley's Sugar Plum Dance! I am in love with this floral design! 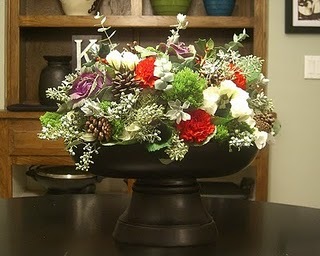 I think of it as a basket full of flowers...a botanical garden or "here's some flower's in your face! 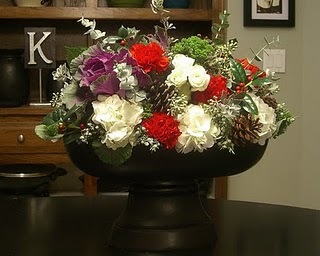 Please look at me from all sides :)"
In my recipe: Cabbage Flower, Hydrangea, Spray roses, Eucalyptus, Seeded Eucalyptus, Pine cones, holly bush and sage from my front yard, Carnations and Christmas greens.